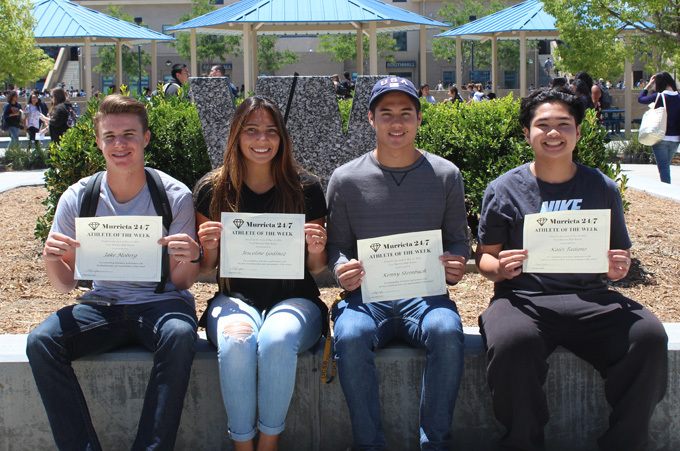 From left: Jake Moberg, Josceline Godinez, Kenny Steinbuch, Kalei Taitano. Not pictured: Candace Yingling. Kenny Steinbuch and Josceline Godinez both competed well in the CIF swimming prelims last weekend. "They each did their respective strokes in their varsity medley relays and PR’d for their farewell performance," said their coach, Cathy Morse. "We are very proud of them and their accomplishments this swim season." Boys volleyball player Kalei Taitano "always gives 100 percent effort," said coach Kristen Cooke. "He set well and was a big part of our success this year." Pitcher Jake Moberg was 5-1 with a 2.83 ERA for the Broncos baseball team. Freshman Candace Yingling hit .535 with 9 home runs this season for the softball team.